LONDON, GREATER LONDON, UK, October 3, 2018 /EINPresswire.com/ — Globally, the largest segment of the market for environmental consulting market (ECS) by type of service is in advising on site remediation, where land wanted for building or development has previously been polluted by industry or extraction. As the chart shows, the percentage of the ECS market accounted for by site remediation varies little by country and is not affected by whether the country has a high or low GDP per capita or is a developed or emerging economy. 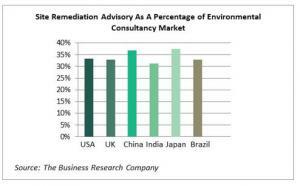 The percentage explained by site remediation is broadly similar in the UK's regulated environment as in the much-less-regulated environment of China and India. In part, this predominance results from the immense cost and duration over time of site remediation projects, and the high value of urban land where contaminated land is most frequently found in many countries. These factors induce would-be developers to regard the cost of professional ECS advice as a minor part of the project and one that they must undertake to obtain official permissions to build. The fastest-growing segment of the ECS market, however, is not site remediation but water and waste management, which grew at 5.35% year on year to 2017 and has now accelerated and will achieve 6.1% annually to 2022. It consists of providing advice and assistance to businesses and other organizations on waste water treatment and solid waste management. Environmental consultants offer expertise on processes to treat solid, liquid, gaseous or radioactive substances waste matter from businesses and other organizations. In the main, this part of the market is driven more by regulations and awareness than issues. The countries where the segment is growing fastest are Spain, Italy, Germany, France and the UK, which already have better-developed waste disposal systems and water management infrastructure, as well as fewer problems with drought or flooding than others where the market is growing only slowly. The effect shows up very clearly in the regional growth rates for the market. Eastern and Western Europe are consistently ahead of the other regions for growth of the waste and water management consultancy market, while Africa and Asia Pacific lag global growth. The water and waste management services of South and North America are growing at near the global average. Solid waste accounts for three-quarters of this part of the environmental consultancy market globally. Environmental Consulting Services Global Market Opportunities And Strategies To 2021 covers environmental consulting market size, environmental consulting trends, and the environmental consulting industry. It is one of a series of new market and industry reports from The Business Research Company that also identify opportunities and explain strategies in a range of industries, provide a market overview, analysis and forecasts of market size and industry statistics, market growth rates, market trends, market drivers, market restraints, market revenues, market shares and company profiles of the leading competitors in over 300 industry reports, covering over 2400 market segments and 56 geographies. The industry reports draw on 150,000 datasets. Extensive secondary research is augmented with exclusive insights and quotations from industry leaders obtained through interviews. Market analysis and forecasts are provided by a highly experienced and expert team of analysts and modelers. Data: Environmental consulting services market size and growth for 7 regions and 12 countries; global regional and country environmental consulting services market size and growth segmented by type of service; global regional and country environmental consulting services market size and growth segmented by end user industry – mining, manufacturing and process industries, energy & utilities, governments and regulators, infrastructure % development, other end users ; global, regional and country environmental consulting services market per capita consumption and market size as a percentage of GDP 2013-21; AECOM, Amec Foster Wheeler, Tetra Tech, Environmental Resources Management, ARCADIS, WSP Global, Stantec, SWECO, Cardno, RPS Group, ICF International, Ramboll financial performance 2013-21. Other Information: PESTEL analysis, drivers and restraints, customer and operational insights, environmental consulting market trends, environmental consulting services market by country covering opportunities, environmental consultancy services associations, investment and expansion plans, corporate tax structure and competitive landscape; environmental consulting services market trends and strategies. Key Opportunities In The Environmental Consulting Services Market Including: Pinpointing the largest global segments and subsegments, and country segments and subsegments in 2018 and 2022; pinpointing the fastest-growing global segments and subsegments, and country segments and subsegments 2014-18 and 2018-2022.